Information sessions typically involve a 20 to 30 minute presentation followed by Q&A and networking time. They provide an opportunity to provide an introduction to your organization, discuss employment opportunities, and highlight recruiting activities. Many employers hold information sessions prior to conducting on-campus interviews so they don’t have to repeat the same information when meeting individually with job candidates. Information sessions are scheduled in the late afternoon and evening to avoid conflicts with classes. 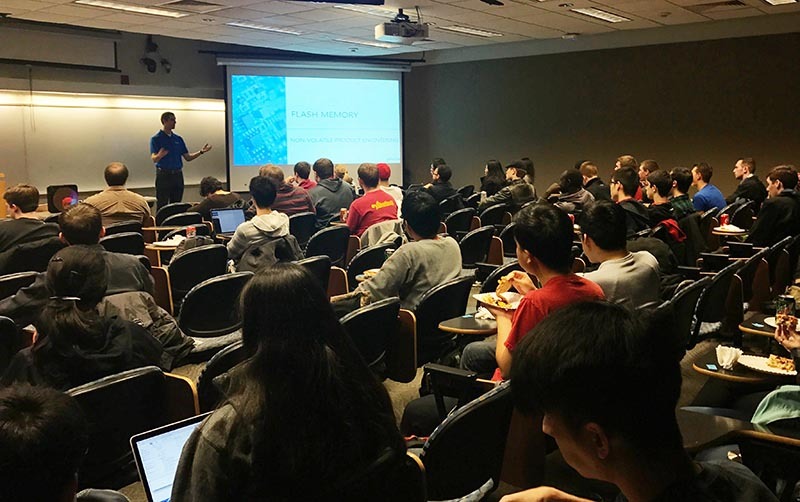 Engineering Career Services helps arrange and promote information sessions to our students free of charge. Interested in holding an information session? 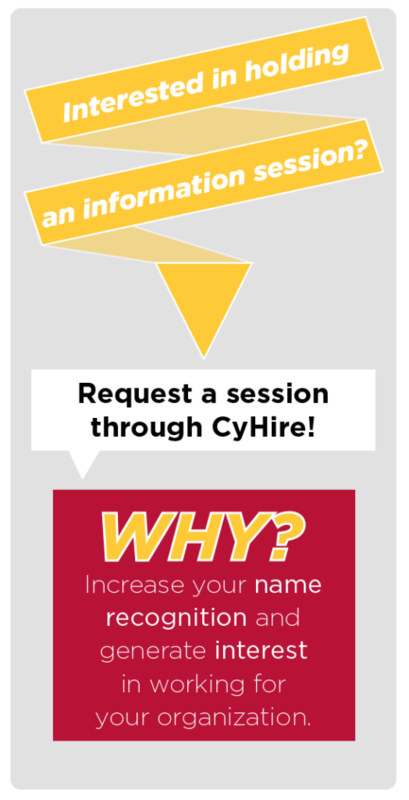 To begin the process of holding an information session, you must make a request through CyHire. This involves completing a simple form that includes the requested date/time, location information, a short description of the event, and the majors of the students you are wanting to attend. Once the event has been approved by ECS, this information will be used to promote the event to students through CyHire. 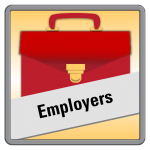 Information sessions must be posted in CyHire for EEOC purposes, and attendance will likely be better since CyHire is the primary source of career information on the ISU campus. You may want to also partner with one or more student organizations to help boost the attendance of their constituents. There are several options for employer of engineering students which are outlined below. Please note that on-campus classrooms are only available after 4PM. If you would like to hold an information session during the day, you will need to reserve space in the Memorial Union, Scheman Building, or off campus. Food catered through ISU Dining is allowed in the meeting rooms. There is a room charge and other policies apply. A room reservation should be made at the MU or Scheman Building before completing the info session request form in CyHire. Once space is confirmed at one of the venues, enter the room number on the CyHire registration form. ECS will reserve a classroom or auditorium on behalf of an employer. Room assignments are made based on first-come first-served practices and availability is limited. Please contact us well in advance of your desired event date (three weeks or more if possible). If you would like ECS to reserve a classroom or auditorium, complete the CyHire info session request form and put TBD in the location. A member of the ECS staff will contact you with location information. Please contact Engineering Career Services (ecs@iastate.edu) if you have any questions.